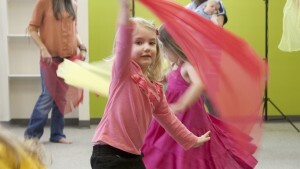 Musikgarten is the leader in early childhood music education—for children and teachers. 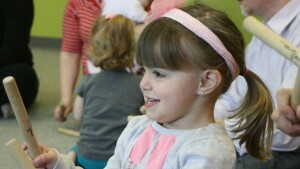 The Lebanon Valley College Musikgarten Program offers a complete multi-year educational program that helps infants, toddlers, and children develop a deep love of music and the ability to express it. In addition to in-class instruction, home materials are used to reinforce lessons and involve the entire family in the Musikgarten fun. CDs and downloads of the songs sung in class, age-appropriate instruments, and parent guidebooks are provided to every student. There are many benefits children gain by taking part in our music and movement program, encompassing musical, physical, emotional, social, and cognitive growth. Our curricula supports the learning process and strengthens these benefits. Musikgarten includes nature as part of the classroom. We believe in the benefits of teaching children to value and respect our natural environment. Even the products and packaging of our home materials is environmentally conscious. Family Music for Toddlers: Recommended for children 16 months to 3.5 years old. This class is attended with an adult caregiver. It is a 12-week program with a 30-minute weekly class. These weekly classes are action-filled for toddlers–full of energy, often on the move, always exploring and learning–and their parents. Together you’ll sing, chant, move, dance, listen, and play simple instruments, all activities that bridge the natural connection between music and movement through four wonder-filled semesters. Each lesson features movement activities for coordination, body awareness and control, exploration of space, and instruments such as rhythm sticks, jingles, rattles, drums, and resonator bars. Cycle of Seasons: Recommended for children 3 to 5 years old. This class is a 12-week program with a 45-minute weekly class. This class is taken without an adult caregiver present until Gathering Time at the end of each class. Celebrate your preschooler’s growing independence and love of the outdoors with activities involving the four seasons in The Cycle of Seasons. Developed to build attention and self-expression, activities include singing, chanting, moving, focused listening, musical games, exploring musical instruments, creative movement, and storytelling. The Cycle of Seasons nurtures your growing child’s ability to use language and participate in dramatic play within a musical context. Music Makers: Recommended for children who are at least four years of age. This class is a 12-week program with a 60-minute weekly class. Your child is now ready for this two-year learning program that includes singing, creative as well as structured movement, playing instruments and ensemble work, ear training and guided listening. This developmentally sound approach to music literacy builds symbolic thinking, concentration, memory, and self-expression. The children start to work with written musical patterns, too. In year I, Music Makers: At Home in the World, your child will be engaged in activities that establish a solid music-making foundation. 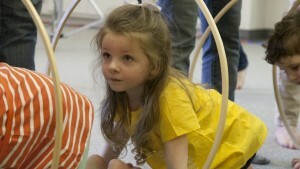 This year focuses on your child’s fascination with nature and develops a love of instruments. Your child will be introduced to the sounds of orchestral instruments individually, and then in the context of an ensemble. Such a listening foundation will lead to long-term success with music reading in future classes. In year II, Music Makers: Around the World, your child will explore the music of the British Isles, Germany, and our own Amerindian and African-American music heritage. She will learn songs, dances, stories, rituals, and customs of these cultures to help her feel and understand others around the world. Music Makers: At the Keyboard: Recommended for children who are at least six years of age. This class is a 15-week program with a 75-minute weekly class. Musikgarten children come to the piano ready to play the songs they have learned to sing, dance, and love. Small group lessons at the keyboard capitalize on your child’s delight in making music with others and allow the children to have success quickly playing songs that they know. Your child will learn to play by ear and to read music. A much-loved piano repertoire of familiar songs improves his ability to read and play with fluency–resulting in pride and excitement in making music! Call 717-867-6373 to attend a free class.